AGV began in 1945, building leather seats for bicycles. The company was owned by Amisano Gino of Valenza, Italy. They entered the motorcycle helmet market in 1948, and right away began endorsing racers as part of their marketing strategy. The Blade is something new: a half-helmet with a little more. A two-thirds helmet, perhaps. Take a full-face helmet, cut off the chin-bar, leave the full visor on, and you come up with the Blade. You get better head protection than a half-helmet offers, plus a little more visor, and you can flip the visor up and shove food or drink into your head without removing the helmet. 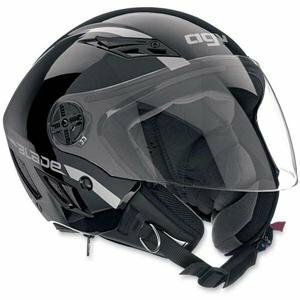 For a very reasonable cost, many of the features of a more expensive helmet are present. The fit is snug and comfortable; the padding is all removable and washable; it's ventilated; and the visor has an anti-scratch coating. It comes in eight variations of five colors and two design themes, and is a surprisingly attractive helmet overall. You gotta wear one, and the Blade is not a bad way to go.